A reminder that, this April Convocation will be election of First Principal Elect and Officers for 2019-2020. As our membership is getting to a critical number it would be very much appreciated if all members would help and volunteer for a chair. 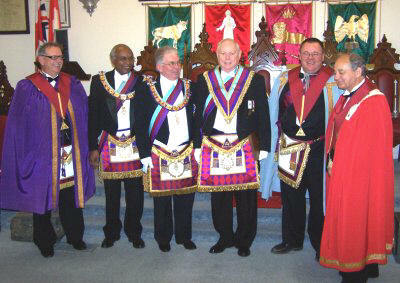 The Travelling Scepter was presented to Kitchener Chapter No. 210, 3494 McBean Street, Richmond on Mon. March 11th, by Ex Comp. David Oltmann! Many thanks to Ex. Comp. Oltmann for riding out the storm! Our By-laws have been completed and forwarded to our Grand Superintendant R. Ex. Comp. Russell Staye!